Free stuff teachers can score for Teacher Appreciation Day on May 8th. I taught briefly in my work career. I was a second grade bilingual teacher in a very poor school district. I spent a lot of my income on things my kiddies needed just to function in class. Most of my friends and family are in the education system so I have a real soft spot for teachers. So today (May 8th) is Teacher Appreciation Day and it’s time to remind all the educators out there how much we value them and what they do for the young minds of the world. They have one of the toughest jobs around and deserve some extra kudos for their hard work. So teachers, thank you for everything you do! And here’s where you can score free food today to treat yourself. Please check before you go to restuarant as you may need info, id, or if a store is participating. Chick-fil-A - Show your teacher ID to get a free sandwich at participating locations today (May 8th), so check to make sure your local Chick-fil-A is in first. Chipotle - Teachers, faculty, and staff can get a buy-one-get-one-free burrito deal in-stores today (May 8th) with a valid faculty ID. 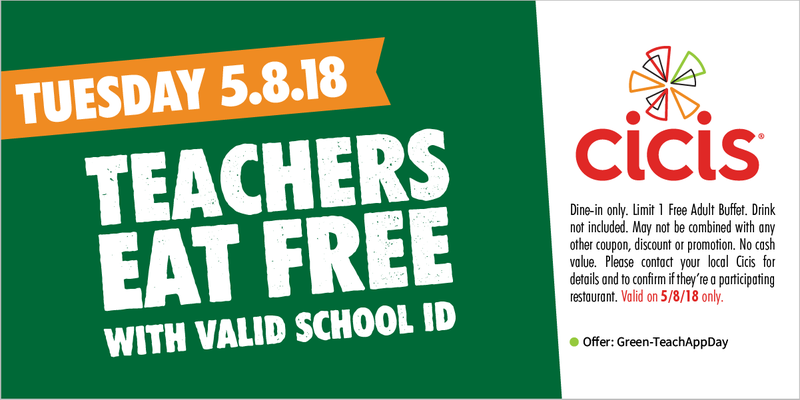 Cici's Pizza - When teachers show their valid school ID and use this coupon today (May 8th), they get a free buffet. Potbelly Sandwich Shop - Teachers can score a free drink or cookie when they buy a sandwich or salad now through May 12th at Potbelly. Raising Cane's - This chicken chain is giving a free box combo to teachers and educators who show their school ID today (May 8th). Uberrito - This Texas chain is treating teachers, faculty and school staff to a free burrito, bowl, salad, or nachos when they show their valid school ID today (May 8th). World of Beer - These guys know teachers might like to unwind with an adult beverage from time to time, so those who show their school ID today (May 8th) will get a free Sam Adams beer or a free Angry Orchard Cider. Teachers who don’t want the free alcohol can get a $5 discount on their check instead.